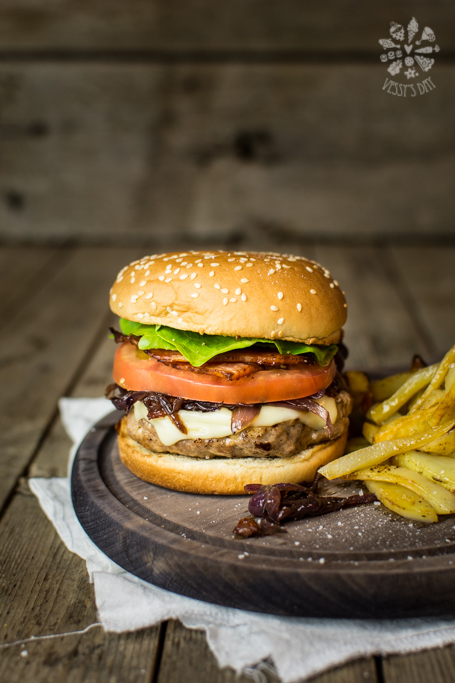 If you are looking for the best burger recipe, I have to say – you FOUND it! I have been making and experimenting with homemade burger recipes for quite some time now! It’s safe to say that I finally have this great recipe, perfect for our taste at home and I kind of know that you all are going to love it! To make the burgers: Combine all ingredients (except the cheese slices) in a large bowl. Mix well with your hands or a rubber spatula until all ingredients blend together. Adjust seasoning by adding more or less salt, pepper, cumin, garlic or mustard. Lay a large tray with parchment paper. Using your hands, roll 8 large balls, then gently press them down to flatten into patties. Put them all onto the tray with parchment paper. Put in the fridge for about 30 minutes to firm up a bit. In the meantime prepare the onions: Heat a couple of table spoons olive oil in a large skillet over medium heat. Add onions, sugar, sun-dried tomatoes, salt and pepper. Cook until soft and caramelized, on medium heat, about 20 minutes. Set aside. Then, preheat your oven to 180C (350F). Line a cookie sheet with parchment paper. Arrange bacon slices over the paper and bake for about 7-8 minutes until crispy. Remove from baking sheet and put in a bowl with a lit to keep them warm. On the same tray, arrange the buns with the cut side up and set aside until ready to bake. In a large skillet, heat a couple of table spoons olive oil on medium-high temperature. Remove patties from the fridge and immediately transfer onto the skillet. Cook on both sides until well done. Once patties seem almost ready, put the burger buns into the oven to bake for 2 minutes. Assemble the burgers: Once patties are ready, place a slice of cheese on top of each, while still hot. Put one patty on every bun, top with the caramelized onions, lettuce, tomatoes and the bacon. Cover with the other half of the bun.